Fishing rod and fishing reel are one of the most important parts of kayak fishing. It needs to be perfect to catch good sized fish and also not too light so that it is over run by a big fish. Here we are discussing the two in brief. There are many varieties of fishing rods available on the market suitable for kayak fishing. To choose one you need to first consider where you are going to store the rod – in craft or in a case, while you are traveling to your launch point and back. It is seen many enthusiasts of kayak fishing go for a telescopic rod, which is about 12 inches in length. It is not tough to store in a back pack and also same when it is stowed in the deck’s hatch. These days with the advancement of technology all the good rods are equipped with rugged materials to provide it flexibility while catching big sized fish. Some truly good fishing rods are being manufactured these days for kayak fishing gear. This part may be a bit tricky if you are budget sensitive. In general fishing reel for kayak fishing gear comes at high price, but remember there are lots of options available and none, to my knowledge, is specifically designed for canoes or small boats. 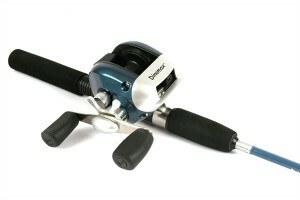 You can though get several fishing reels designed for light lines and small rods. Also, take note that reels made for fishing from a pier or a bank may not be fit as kayak fishing gear because of their fragile nature as well as exterior moving parts. Personally I have seen those fishing reels which are known as “egg beaters” or spinning reels having spool at the front end can be easily damaged if used in kayak fishing as its bail is easily bentable and the distance of it from the rod make it a bit difficult to place on the deck. I prefer bait caster models fishing reels. Though it is a bit expensive but is robust. Oh yes, a land practice of some sort is recommended before using this in kayak fishing because it can easily over run. This entry was posted in Kajak Fishing and tagged Fishing, Fishing Gear, Fishing Reel, fishing-rod, Kayak Fishing, telescopic rod on March 15, 2013 by KayakFisherman. |Kayak fishing is not only relaxing, it is rewarding as well. It is a popular sport, a fun and inexpensive way of getting out on the open water. Except for rough waters, it hardly has any limitations. Fishing kayaks have an ability of being launched from almost anywhere water is available, making them an excellent choice for fishing. Ease of transport and low-cost allows kayaks to be operated by more people. * The reasons that make kayak fishing so popular are quite hard to ignore. Kayaks usually weigh as less as 30 pounds. This means, you can tug them on your car roof and drive to the lake later from where they can be launched and be taken to any type of shoreline. * Kayaks also do not have much deepness or draft. Because of this, they can be used to access even very shallow water. Furthermore, kayaks are quite swift and maneuverable, which is why taking them to tight areas is quite easy. * Another great advantage of using fishing kayaks is that they do not induce waves or wake as there is no motor attached. Kayaks also do not produce any harmful emissions because of which it is the first choice for eco-conscious people. * The best part about kayak fishing is that it can be enjoyed even by a casual angler and only basic skills are required for it. Many anglers enjoy the liberty and exercise that kayak fishing offers. Two models of Kayaks are available – Sit-in model and Sit-on-top model. Sit-in model is more of a traditional style. In this model, your lower body sits in the kayak. However, Sit-on-top models are a modern version of traditional kayaks. In this model, you sit on the top of the double-hulled kayak. Although, Sit-in kayaks appear to be more stable than hulled kayaks, but in actuality sit-on kayaks are much wider and are as stable as the sit-in model. Sit-on kayaks have an upper hand over the sit-in models since they are more adaptable for fishing because of their flat-top design and extra space to attach accessories. The size of kayak you choose should depend on the type of water you’re going to use it on. Ocean kayaks are longer than the kayaks used on the river and inland lake water. The difference is basically due to difference in the height of waves. Kayaks are generally single-person models, but some fishing kayaks can also hold up to three passengers. Kayak fishing gear should contain a mixture of essentials including paddle necessities, safety items, and fishing and tackle gear. Although a wide variety of gears are available to outfit kayaks, the most common items included are tackle box holders, rod holders, and live bait wells. You must also spend some extra money on lightweight paddles and a comfortable seat. You will obviously be able to do more fishing if you are comfortable. Another important item that you should not miss is a paddle tether. Find Kayak fishing and other accessories for sale online at www.paddlerscove.com. Browse through a variety of stuff like kayaks, ocean kayaks and so forth. To know about discounts for the season visit the site www.paddlerscove.com. This entry was posted in Kajak Fishing and tagged Angler, Deepness, Fishing, Fishing Kayaks, Harmful Emissions, Kayak, Kayak Fishing, Loving, Models, Open Water, Popular Sport, Rough Waters, shallow-water, Shoreline, Sport, Sport Online, sport-fishing, Tight Areas, Waves on April 26, 2011 by KayakFisherman.